Daylight savings time has arrived along with this week’s Monday Cover, Melissa. If you skate much here in the Northwest, chances are you have seen Melissa gettin’ her shred on. 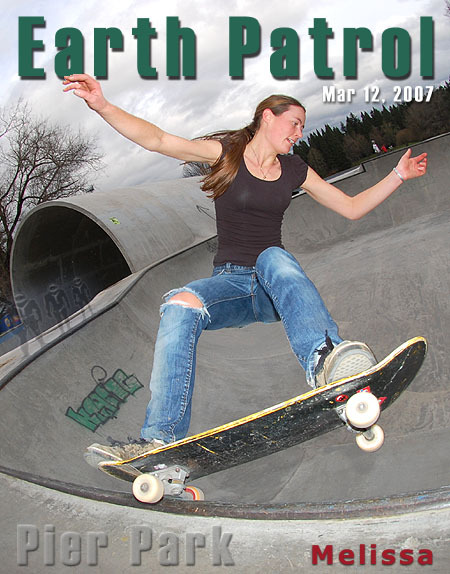 Here she is laying down a stylin’ frontside grind at Pier Park. Congratulations Melissa and keep the stoke! Congrats Melissa on being the first woman to make Monday Covers. Glad to finally see some diversity in the EPM pix. Way to go Melissa – that’s my girl!! Finally! Boys respect girls. The War Is Over! I always enjoy skating with Melissa. She’s not afraid to charge a gnarly wall. She’s moving to Tahoe to find work. Come back soon.